Finding popcorn without palm oil is possible. You must be sure to read the labels. As with everything, the less ingredients, the better. You can always make your own from an air popper or on the stove top. However, it’s great to have the option to buy pre-popped popcorn for convenience, as an easy snack, and when you’re on-the-go. Yes, it’s convenient and delicious, but do not buy microwave popcorn as it most always contains palm oil. Update: See below for one brand of microwave popcorn without palm oil. Regarding bags of already-popped popcorn, unless you know for certain they’re palm oil free, it’s best to avoid more exotic flavors such as chocolate, cheese, and coated varieties. Often holiday varieties of popcorn contain palm oil. Remember, many popcorn brands and flavors contain palm oil derivatives that won’t have the word “palm” in the ingredients. Learn about how companies use palm oil so you can find it on labels. Please support these choices of palm oil free popcorn. Popcorn review: We buy Skinny Pop Original a lot. It’s a great snack for home and on the road. It only contains Popcorn, Sunflower Oil, and Salt. The Skinny Pop Mini Cakes are amazing. They are a fun way to eat popcorn in a small version of a rice cake. They are excellent for lunchboxes and snacks. We regularly buy the Sea Salt, Salted Caramel, and Cinnamon & Sugar Mini Cakes. Sometimes we mix the Sea Salt with one of the other flavors for a sweet and salty mix. We look forward to buying their other palm oil free flavors when we see them in our local stores. Popcorn review: Ever since Costco started selling Angie’s Sweet & Salty Kettle Corn, our family buys several bags monthly. My family and I love this popcorn. It’s unbelievably great — the perfect blend of sugar and salt. It’s a convenient and healthy sweet treat for our family. This popcorn, made without palm oil, only contains Popcorn, Sunflower Oil, Cane Sugar, and Sea Salt. We’ve also had Angie’s Sea Salt Popcorn, which is also delicious. Do be aware some of their specialty seasonal flavors, like Candy Corn flavored Kettle Corn and Pumpkin Spice Kettle Corn each contain palm oil and palm kernel oil. Popcorn review: Look at these flavors! Lesser Evil doesn’t use any palm oil in their popcorn and other snacks. Their organic popcorn uses quality ingredients. Depending on the flavor, some ingredients include Himalayan salt, organic extra-virgin coconut oil, and/or extra-virgin avocado oil. Popcorn review: We enjoy the large bag of Popcornopolis’s Nearly Naked Popcorn when we see it at Costco. Unfortunately, it’s not always available. We buy it when it is. This popcorn is delicious and very flavorful. There are few kernels at the bottom of the bag. My kids, husband and I all love it. Hopefully, Popcornopolis will include their ingredients on their website soon. Because they aren’t listed, and we aren’t able to find all of their flavors in stores, we can’t cross-reference their ingredients to check for palm oil. We were only able to verify the ones above. Via email, Popcornopolis confirmed these popcorn flavors below are free from palm oil. Again, do your own due diligence and read labels. 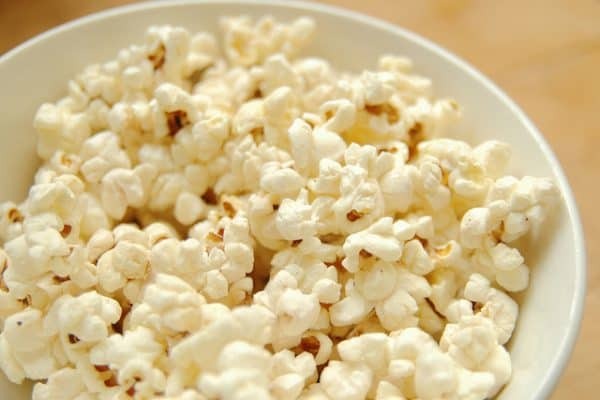 Popcorn review: We’ve tried Simple Truth Organic Low Sodium Popcorn and love it. This is also something we purchase when we are on road trips and going to friends’ homes. Simple Truth is a Kroger brand, with organic and non-organic lines. While it’s not available everywhere, we were able to purchase this popcorn at Kroger-owned stores. Please support these flavors of popcorn without palm oil. Let companies know you want products without it. See our post which lists Palm Oil Free Products in different categories. Remember, you must avoid microwave popcorn unless you buy this one brand from Quinn as explained below. Otherwise, every single brand we researched contains palm oil or palm kernel oil. If you look at the ingredients in stores, you will see this for yourself. We are grateful to Quinn Snacks for being so innovative with their microwave popcorn. We appreciate them using such quality ingredients. If you are at the movie theater or sports venue, etc., you will have to ask about the ingredients. We usually avoid it unless we speak to the manager. It might contain palm oil. Additionally, it is likely to contain a lot of artificial ingredients. While at home, you can make homemade popcorn. It doesn’t take long, especially if you have an air popper. Then, you can add your own salt, butter, cheese or caramel creations, knowing exactly what it is. We use a Hamilton Beach Hot Air Popcorn Popper. It’s simple enough for my kids to use, fast, and pops practically all the kernels. Look for sunflower oil, safflower oil, and coconut oil popcorn. When you are looking for palm oil free popcorn, you need to carefully read the labels for butter popcorn. Many times, you will see ingredients such as tocopherols, and/or medium chain triglycerides. These typically contain palm oil. Popcorn is a healthy snack. Plain, it’s low in calories and fun to eat. Snacks without palm oil. When you are at the store, just remember to read all labels. Look for simple ingredients such as popcorn, coconut oil, and salt so you know what you are getting. Many times, the label won’t spell out “palm oil” but it still may contain palm oil derivatives. We have reached out to these companies to confirm their popcorn is made without palm oil. We continue to update with post as companies return our emails. Please support these brands and flavors of palm oil free popcorn. See our other lists, including candy without palm oil and pretzels without palm oil. Know that while we work very hard to live without palm oil, we aren’t food scientists or medical professionals. We gathered this information by researching popcorn in stores and online; researching out to manufacturers; and learning all we can about the names for palm oil. Please always read ingredient labels when you are looking for popcorn without palm oil. This list is meant for reference only. Another company that has no palm oil and organic is Lesser Evil Buddha Bowl popcorn. It only has 3 ingredients: non gmo popcorn, coconut oil and Himalayan pink salt. Hello Tammy, thank you for taking the time to comment with another palm oil free popcorn. We will reach out to them. We would love to add them to this list. Thank you for reading labels and for being a proactive consumer! We were able to add Lesser Evil to our list. They confirmed they make all of their popcorn and snacks without palm oil. Thank you, Tammy! I was shopping at Target today and was surprised I couldn’t find microwaveable popcorn without palm oil! That’s what brought me to your website. I also have an addition to your list: Whole Foods 365 Organic Microwaveable Popcorn. It’s only ingredient is, apparently, popcorn! Not very tasty for some, but you can always add your own flavor. Hello James, it’s great to hear from you. Thank you. It was great learning how you found our website. So far, we know most of the Quinn microwavable popcorn flavors are palm oil free. We will look the next time we go to Whole Foods to check on Whole Foods 365 Organic type you listed. Online, we were unable to find it listed without palm oil. Thank you for taking the time to write to us and to help with a suggestion. It’s great you read labels and are a proactive consumer. We are looking forward to a time when companies realize consumers are actively seeking products without palm oil.